Bread is kept in a basket or a nylon bag, and small pieces always accumulate at the bottom of it. 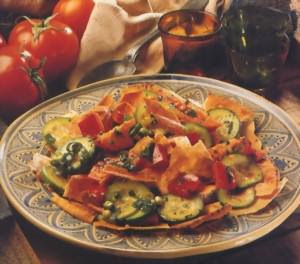 The salad known as fattoush makes use of them and prevents their waste. Separate the leaves off the parsley, mint and purslane. Slice the cucumbers, dice the tomatoes. Pound the garlic with the salt and mix it in the oil and lemon. Mix the vegetables and top with the bread fragments. Pour the sauce and sprinkle sumac all over.